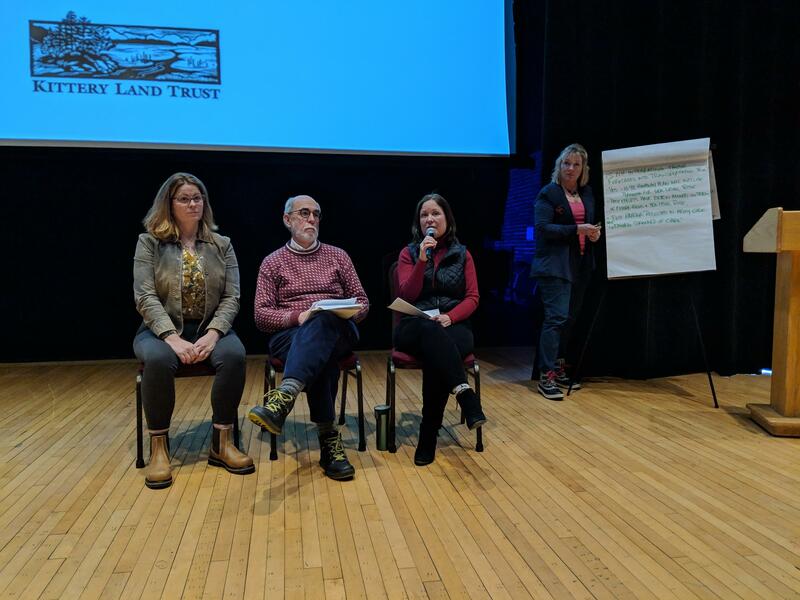 State Sen. David Watters speaks at the Seacoast Environmental Film Festival with Center for Urban Watershed Resilience director Wendi Goldsmith, left, and Rockingham Planning Commission planner Julie LaBranche, right, at the Kittery Community Center. Its communities face an increase in many problems the Seacoast shares, such as nuisance flooding during high tides and storms, inundation of natural and historic resources and waterfront homes, and difficulty maintaining roads and sewer systems. Watters said on the panel after the film, called “High Tide in Dorchester,” that New Hampshire shouldn’t wait for federal intervention before responding to those issues. “The activism at the community level and the state level is what we can do and we must do,” Watters said. He plans to propose a bill this session that would let towns work together to declare climate change emergencies and set up revitalization districts in affected areas, such as along Route 1A in Hampton Beach and Rye. A study last year showed the property tax rolls of those towns will be most affected by rising seas, with hundreds of millions of dollars in real estate potentially threatened by the end of the century. Watters’ bill would create funds and commissions geared toward coastal resilience and protecting at-risk historic resources – including setting up preservation districts elsewhere in the state where artifacts could be moved out of harm’s way. Watters says he and other legislators are also planning what he calls a “panoply of bills” to spur renewable energy development and reduce the state’s carbon emissions. Read a draft of Watters' coastal resilience bill below. New research suggests New Hampshire forests could help store more climate-warming carbon dioxide while growing higher-value trees. The study, from Clark University and the Nature Conservancy, says better land management – especially reforestation – could store up to a fifth of America’s climate-warming carbon emissions.